Timing is everything in surfboard manufacturing, but Keoni Boyd does not wear a watch. Nor does he have a cell phone. Going back to his days with the legendary Hermosa Beach boardmaker Wayne Miyata, Boyd used other means to punctuate the phases of making a board: When determining when to “pull tape” between steps in the glassing process, Boyd learned to rely on the time it took to smoke a Kool King cigarette. This folkloric style colors Boyd’s approach to all aspects of his work. (To signal the amount of catalyst to be added to resin, Boyd pinches his thumb and pointer finger together.) Today, Boyd is a sought-after ding repairer and airbrush artist, adding the distinguishing flare that surfers seek. “As far as the way he does ding repair, it’s old school. He’ll do a bit of solar res, some of the modern stuff. But he usually blocks stuff, more like the way you build a surfboard than repairing it. He’s an amazing artist so his repair work is really meticulous,” Hatzikian said. 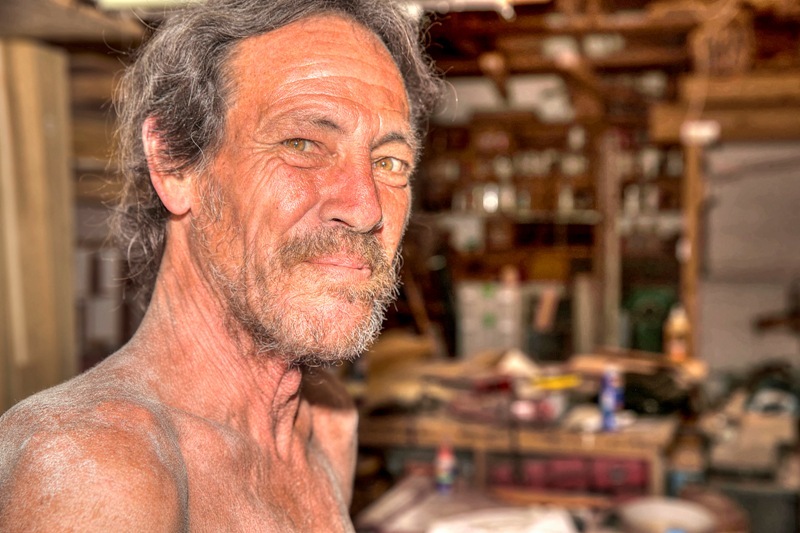 Over more than 30 years in Hermosa, Boyd has become a fixture of the Cypress district: shirtless, dusted with fiberglass, a perpetual smile on his face. Shapers, glassers, woodworkers, recording engineers and auto mechanics all hail him by name. This Saturday, Boyd will celebrate his time in Hermosa with a show at the Shock Boxx art gallery on Cypress Street. The show, headlined “Do what I want” after a frequent Keoni-ism, will feature sketches, wall art and boards that Boyd has done over the years. All proceeds from the show will go to Boyd. Thousands of boards have passed through his hands, and the visual nature of his mind goes on display as he recalls intimate details about ones he worked on from years ago. It is one of few times in which the humble Boyd will display any sort of pride. But mixed in with the triumphs are moments of tragedy and periods of darkness. He has not seen much of his family in decades, and has endured the death of some of those closest to him. Underneath the humble exterior, though, is what many in the industry describe as an immense talent. Surfer and Hermosa Beach native Mike Siordia has known Boyd for some two decades, dating back to the time when Siordia’s father managed Miyata’s shop. Siordia recalled paying Boyd for artwork in cases of Miller Lite and cartons of Kools. “Keoni is one of the most underrated artists on the planet. And he chose to be that way. He’s an amazing talent,” Siordia said. In surfing, as in life, art fills the gaps that science leaves behind. Keoni Boyd was born in Hawaii before it became a state, a fact that says less about his longevity than it does about the newness of the islands to American dominion. Though he has not returned to Hawaii since arriving in California in 1983, his personality — both the intuitive, artistic side of him, and his easygoing demeanor — still pulses with the flow of the islands. Boyd grew up in Kailua, on the east, or “windward” side of Oahu. Surfing was a part of his life from the beginning, and Boyd learned his first lessons about board repair from his grandfather. He attended elementary school with future big-wave surfer Buzzy Kerbox. Eddie Aikau, the legendary Hawaiian waterman and namesake of the Waimea Bay surf contest, was a cousin. Hawaii became a state in 1959, the same year “Gidget” was released, and took surfing from outsider hobby to mainstream marketing machine. But in the transition, Boyd recalled, there was a general unease among many Hawaiians about surfing, a fear that it could complicate the process of assimilating with the United States. His artistic talents emerged early in life. Boyd followed his mother to Honolulu, and enrolled at Pearl CIty High School. One night during his time there, he spray painted a mural of a wave in a wall against a stairwell. The next morning, he was summoned to the principal’s office. He sat across from the principal, nervous about the scolding he was about to receive, and what waited at home from his mother. What he got instead was his first taste of being appreciated as an artist. Boyd had jobs with several shapers growing up, including Ben Aipa, who in the mid ‘70s shaped boards for Buttons Kaluhiokalani and many of the world’s best surfers. The job got him free surfboards, and began experimenting with airbrushing. The technique, in which paint is typically sprayed on the foam core of the board, was just coming into popularity. Terry Fitzgerald, an Australian surfer nicknamed the “Sultan of Speed,” rode boards featuring psychedelic designs of fellow Aussie Martin Worthington. The first airbrush Boyd recalls doing was comic book hero Conan the Barbarian, which Boyd put on a big-wave gun. Another featured an image of Blondie frontwoman Deborah Harry. After graduating from high school, Boyd, like almost everyone he knew, got a job in one of the many tourist hotels. He worked at the Ilikai Hotel, which fronts the surf break Ala Moana. Boyd lived above a restaurant. He didn’t have much money, but he would sit at the bar and sketch. He traded the pictures for drinks and food, and quickly made friends with the cooks and waitresses. Boyd later got a job at the International Marketplace, where he sold and developed film. While there he bought a cheap water housing for a camera, and took surf photos. By his own description, he didn’t take it too seriously, preferring to surf. Nonetheless, a photo he took somehow got noticed by someone from the Eastman Kodak corporation, who asked to turn it into a postcard. When asked about the postcard Boyd quickly changed the subject, switching to a description of a smaller, more humble accomplishment — his efforts at the Marketplace’s holiday window display decorating contest that year. He can still vividly describe the scene, which featured a reindeer throwing a pie at Santa’s face. Later, Boyd was offered a promotion to manage a new location of the marketplace elsewhere on the island. He declined. Taking the job, he said, would have meant skipping ahead of a tutu, the Hawaiian word for grandmother. The recession of the early ‘80s meant a slowdown in the tourist business. Keoni got work when he met a man named Bob Johnson, a contractor who had sailed from Washington state to Hawaii, where he worked on houses including Tom Selleck’s home on Diamond Head. It was from Johnson that Boyd learned woodworking. By this point, Boyd’s mother was living in Southern California, and urged him to head out, hoping to get him a job in the burgeoning aerospace industry. He briefly worked at Northrop Grumman after arriving — making friends with Chuck Yeager, the first person to break the sound barrier — but it proved only a detour to his career in the surf industry. Boyd was introduced to Wayne Miyata through George Watanabe, a fellow Hawaiian transplant who worked for the city of Hermosa Beach. 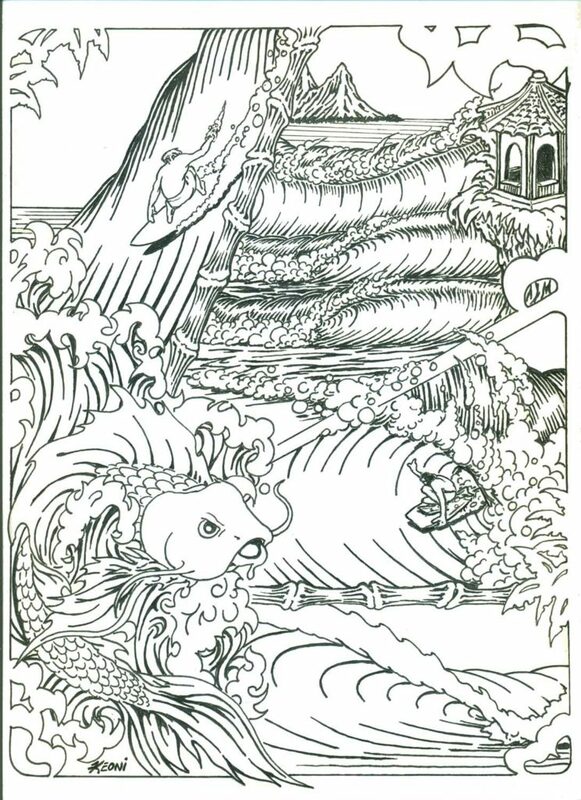 Watanabe saw Boyd surfing at the Topaz Jetty one day, and instantly recognized him as a native Hawaiian by his style. Miyata and Boyd became extremely close, working together constantly. Barahona compared the relationship between Boyd and Miyata to that of father and son. “Wayne was his idol. They worked together for such a long time. And Keoni was always saying, ‘Wayne taught me to do it this way,’” Barahona said. Miyata was a skilled artisan, but volatile. He went around armed and would occasionally fire rounds into old boards kept in the back of the shop. But he reciprocated Boyd’s devotion. A fan of NASCAR, Miyata would head to the California Speedway, in Fontana, whenever there tour came to town, and he would take Boyd with him. One year, Miyata and Boyd were sitting in their usual seats — in yet another instance of Boyd’s visual recall, he recalled sitting “by the King Taco sign at Turn 3” — when Miyata got word that Paul Newman, the Oscar winning actor and noted racing fan, was in also at the speedway. The previous Christmas, Miyata and Boyd had worked on special board for one of Newman’s daughters. Newman was grateful for the job they had done, and invited the two into his private box. Miyata went, but Boyd declined. Boyd describes his time on Cypress as of one outsize personalities and close relationships. Hap Jacobs, for whom Boyd has also worked, recalled when Hermosa Beach Police Officer Tommy Thompson roared into Miyata’s shop on his motorcycle, terrifying tenants in the surrounding buildings. By the third or fourth time people became accustomed to it. Jacobs and Boyd later collaborated on a special board as a wedding present for Thompson and his wife Ginger Eiseley. “They were worried. They didn’t want me to go cuckoo,” Boyd said. Another dark moment came in 2005, when Miyota succumbed to esophageal cancer. “I shut myself off,” Boyd said of the period. “When Wayne died, I almost thought Keoni would too. He took it really hard. He was devastated,” Barahona said. But Boyd returned to work, taking up repair positions at Shoreline Glassing, Aquatech and eventually the space he shares now with. He continues to receive repair orders from customers and other shapers in the area. He has also turned his attention to art beyond boards. He painted, freehand, a car on the ceiling of Granny’s Grocery a few blocks west of Cypress. His periodic visits to the store endeared him to the staff there, and he would occasionally show them some of his sketches. Recently he was speaking with Betty Gregorian, who works at Granny’s, showing her some of his drawings and mentioned wanting to turn them into a coloring book. She approached Mike Collins, who opened Shock Boxx gallery along with Laura Schuler, earlier this year, about a show of Boyd’s art. Collins was instantly taken with the idea. “Our whole thing when we started this was, we want to be sensitive to what was here before. And nothing has been down here more than Keoni,” Collins said. “The vagabond part of surfing is pretty much gone. I think that was the most fun: being able to work wherever you wanted to, make as much money as you think you needed, and then take off for the next town, go up the coast or something with the money you have and just hang out until it started running out, then go find a surfboard shop where you could go work at for two or three days and keep going. That was a lot of fun,” Miyata said. Boyd constantly references Miyata, often slipping into the present tense. But it’s not clear that he would agree with this sentiment. Along with negating the solace Boyd has found by remaining in one place for so long, Miyata’s lament betrays a separation between those living the vagabond lifestyle and those financing it: people with knowledge of glassing and ding repair, and those without. Earlier this week, a young boy and his mother wandered into the Cypress district. The boy had a surfboard under each arm, and mother and son headed with purpose toward Boyd’s shop. It was business hours, around 3 p.m. And though the wall-size door to the space Boyd shares with a woodworking shop was unlocked and swung wide open, the pair slowed their pace when they failed to see anyone inside. They cautiously looked around the open-air entrance, standing and waiting, as if looking for a bell to ring. It was only a few seconds before Boyd looked up from a joking conversation with a fellow Cypess tenant on the south side of the parking lot, and saw the customers. He strolled over and said hello. Boyd set one board aside and put the other on a pair of saw horses. Boyd bent over and laid an ear to the board, listening like a doctor with a stethoscope, and tapped along the board’s surface. “Sounds like a 4 oz. single,” Boyd said of the glass job. The youngster sheepishly described how the dings got there, insisting that one of the boards was damaged while a friend was riding it. Boyd cuts off any embarrassment. “It happens. It’s part of surfing,” he said. The interaction revealed the intuitive ability and friendliness that has endeared so many people to Boyd. In his dealings with customers, he always volunteers to teach customers about ding repair. 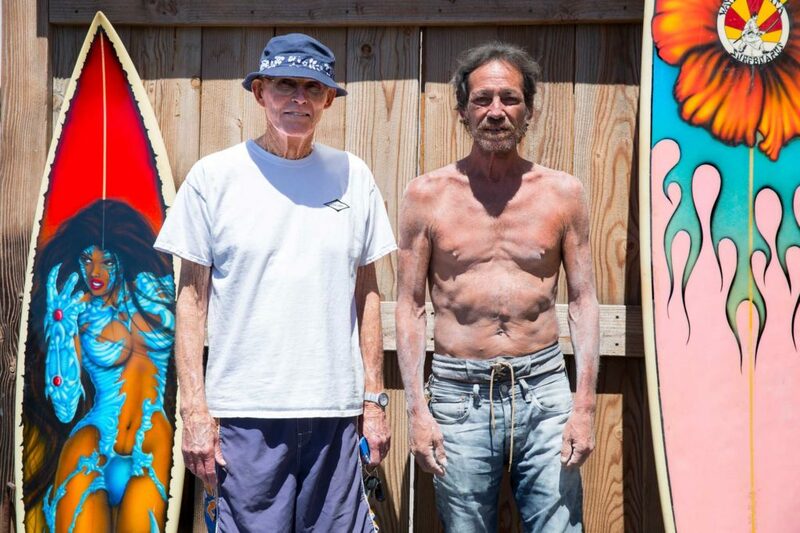 “If you’re going to surf, you should learn how to repair your own board,” Boyd said. Of course, if everyone followed his advice, Boyd would be out of a job. But to mention this to Boyd would be missing the point. Boyd himself claims to have never paid for a repair job, a wetsuit, or even a surfboard. For him, the exchange is more than commerce and craft. Art occupies an odd place in surfboard manufacturing and surfing more broadly. Board art may not be functional, in the way of fin placement or rocker outline, but neither is surfing itself. Mark Richards’ pointing left arm, Gerry Lopez’ lazy back knee, Tom Curren’s nonchalant right hand: none of these things played much of a physiological role in getting waverider from peak to shoulder, but they are among the most memorable things about a ride. They are style, something difficult to teach and impossible to fake. For Boyd, style and lifestyle are impossible to separate. Boyd, Siordia said, embodies an ethos that is easily forgotten amidst the shrinking margins and steep competition board manufacturers face. “Do What I Want”: The Keoni Show, debuts Saturday at 7 p.m. at ShockBoxx gallery at 636 Cypress Ave. in Hermosa Beach.